A flurry of new accounting standards has been issued in recent years, and 2019 and 2020 promise to be a time of heavy activity as your utility either evaluates a new standard’s impact or dives into the implementation process. Whether you follow standards set by the Financial Accounting Standards Board (FASB) or the Governmental Accounting Standards Board (GASB), you’ll need to evaluate some of the new standards. FASB issued new standards on revenue recognition and lease accounting several years ago. GASB has issued new standards on asset retirement obligations, fiduciary activities and leases that are either being implemented now or will be in 2020. Knowing where to start can be intimidating. For example, say your utility is reviewing the GASB Statement No. 87 lease accounting standard. You believe based on your experience this new standard won’t affect your utility and there are no items that meet the materiality test to be recorded as a lease. Although this may be the case, your utility still needs to evaluate current contracts to determine if they are leases and develop business processes and controls to evaluate future contracts for lease treatment. 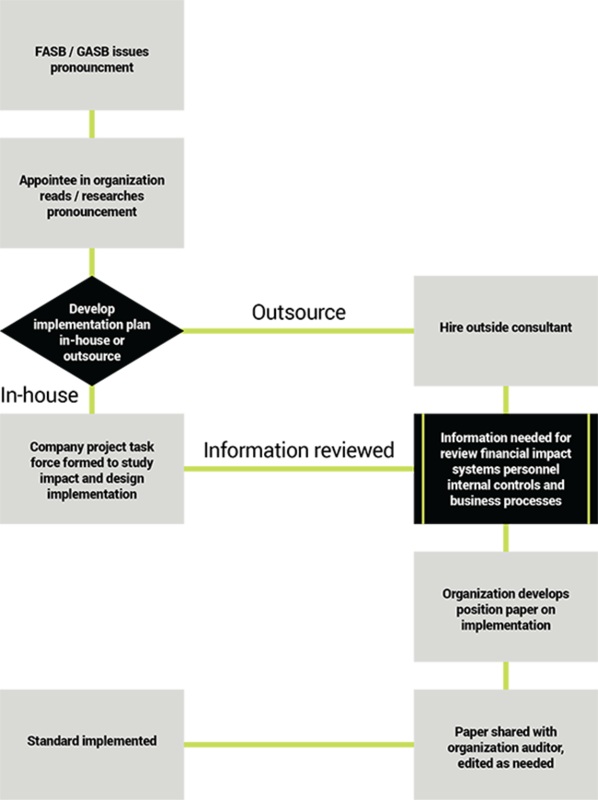 Your goal should be to develop an implementation plan for utilizing standard-specific informational resources, assigning tasks to your project team, and setting milestones and defined deliverable dates. This way you can ensure everything will be in order when your year-end financial reporting next rolls around — booked and disclosed, if needed. Fortunately, we live in the age of information with countless resources at our fingertips to take some of the angst out of the process. Both FASB and GASB post full standards as well as implementation guides online. Your accounting services provider may also offer digital resources such as webinars, resource centers, implementation guides and articles that provide actionable insight on the standards that may affect your utility. And don’t forget – behind those digital resources are your accounting firm’s knowledge professionals to provide hands-on assistance and most directly obtain answers to your accounting standards questions. When is the final project deliverable due? What resources do we have already? Where can we find help to fill in knowledge and people gaps to meet our milestones? When the standards board issues a pronouncement, a designated utility employee will read and research the new standard and the organization will determine whether to develop the implementation plan in-house or seek outside assistance. Gather information requested by the consultant for review including that of systems, personnel, financial impact, business processes and internal controls. Implementing a significant accounting standard can seem daunting, but using a methodical, project-based approach can help the transition. Don’t struggle alone – fully maximize the resources available to guide your journey from informational assistance to specialized professionals.